Powerful tabloid chiefs campaigning to ban Leveson Two face questions over ‘buried’ £150,000 payments to Private Detective - Sun Editor and IPSO watchdog boss linked to new evidence. THE DAILY MAIL group kept quiet about the substantial sums of money secretly paid to a private detective – even after the police began probing his criminal conduct. Steve Whittamore raked in £150,000 from the controversial publisher even AFTER he had been raided. Much of the money was given to him after he had been CONVICTED for unlawful data theft. The extent of the fees was buried in folders of accounting spreadsheets disclosed by Associated Newspapers to Phase 1 of the Leveson Inquiry. The files were only released in response to a document request at the hearing into press conduct and ethics run by senior judge Sir Brian Leveson – and even that data was incomplete. Remarkably, Daily Mail bosses did not spell out the figures in their own testimonies when questioned on their use of PIs. Neither did they release any of the source documents - such as payment slips and invoices - associated with the unlawful transactions which would have made the shady nature of the deals clearer. 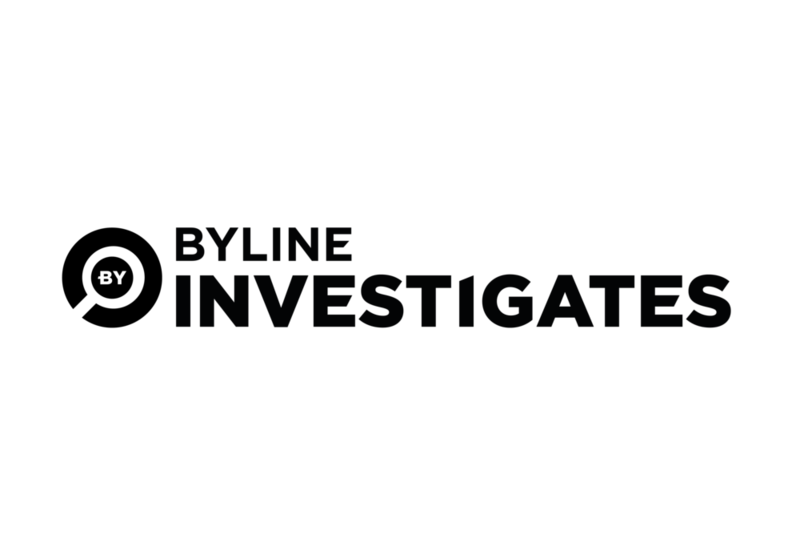 Now Byline Investigations has exclusively obtained 54 payment slips, issued by the Daily Mail and its sister papers, showing that bank transfers to the PI carried on for 32 months after the raid on his house and long after his conviction. And for the first time, we have analysed Associated News accounts' data that has never been made public – buried in previously unpublished documents at the inquiry. Last night politicians, press abuse victims and reformers called for fresh evidence to be officially investigated. Former Prime Minister Gordon Brown, whose bank account was rifled by similar blaggers for other Fleet Street papers, urged the government to go ahead with the second part of the Leveson Inquiry. 'We have the statements made by people who were in police at the time that have been sent to [Culture Secretary] Karen Bradley as a reason for taking action." Whittamore - who was raided by the ICO and arrested by the Metropolitan Police a few weeks later - was subsequently named in civil and criminal hacking cases, involving these other newspapers. Because he provided unlawful information used later in voicemail interception, even though he did not do the hacking. Legal insiders are of the opinion that a substantial amount of the information supplied by Whittamore, in cases against the News of the World and the Trinity Mirror titles, went on to be used for the purpose of unlawful phone hacking and other ‘dark arts’. Whittamore was the private detective commissioned by the News of the World to unlawfully obtain murdered schoolgirl Milly Dowler’s mobile phone number, which was later hacked by News of the World employees. The scandal, exposed nine years later, led directly to the paper’s shock closure by owner Rupert Murdoch, who has recently launched a new bid for Sky. Whittamore did not know that he was getting Milly Dowler's number and was appalled to find out her voicemail was later hacked without his knowledge. Both Mirror Group and News Group have paid compensation to hacking victims specifically for the intrusion caused by Whittamore and similar private detectives. The Daily Mail has paid nothing. Astonishingly, the Daily Mail paid nearly as much to Whittamore AFTER he was raided by the ICO as they did before. The Daily Mail, Evening Standard (then owned by the Mail Group) and Mail on Sunday continued to hire Whittamore long after he was given a conditional discharge by a court in April 2005 following his guilty plea. The criminal inquiry, code named Operation Glade, was carried out by the Metropolitan Police, and focused on illegal access to and theft from the Police National Computer. The Daily Mail also ignored warnings from the ICO given to the Press Complaints Commission, the regulatory body upon which Dacre and Wright have served. The Information Commissioner's Office, the watchdog in charge of Data Protection, was running a similar inquiry - called Operation Motorman - into illegal “blagging” of vehicle registrations, mobile phone numbers and phone billing data. The Mail continued to use Whittamore for illegal access to phone data long after many other newspapers had dropped him. The paper's highly-regarded reporters remained prolific users of his firm, JJ Services, based in New Milton, Hampshire. In 18 months after his conviction in April 2005, The Daily Mail alone paid him nearly £74,000. In total, Associated Newspapers, including the Mail, Evening Standard and the Mail on Sunday, paid Whittamore £85,750 after his conviction. Press reform campaigner Alistair Campbell last night accused the Daily Mail of hypocrisy. The former Number Ten spokesman said: 'If this level of deceit and skulduggery was revealed in any other industry, newspapers like the Mail would be turning the outrage volume very high. But yet again we see the cant and hypocrisy of the Mail for what it is. "Dacre explodes at the mere suggestion the Mail may have got up to the kind of thing that led to Leveson being established," Campbell told Byline Investigations "yet here they are continuing to hire one of the baddest of the bad apples in their trade." The Daily Mail carried on tasking Whittamore even after the Information Commissioner's Office contacted all newspapers in 2003, 2004 and 2005. The ICO repeatedly warned editors in meetings and letters to Press Complaints Commission – of which Daily Mail editor Paul Dacre was a member - that PIs were up to no good. But the Daily Mail continued to task them even after the ICO published a damning report called ‘What Price Privacy?’ in early 2006. Notably, the findings from Operation Motorman and the investigation into Whittamore and the unlawful trade in personal data, was presented to parliament. * For a decade between 1998 and 2008, he sat as a member of the Press Complaints Commission, assessing grievances from the public. * He became a member of PressBoF, the committee of newspaper executives that oversaw the PCC, in 2004. * For the past nine years, Dacre has been chair of the Editors’ Code of Practice Committee of PressBoF, but is due to step down soon. * In 2008, his right hand man Peter Wright, was appointed a commissioner of the PCC. At Leveson, the papers' executives admitted to paying Whittamore the invoices seized by the Information Commissioner's Office in their raid on March 8th 2003. But in their oral evidence and written statements, they did not speak about the subsequent incriminating invoices held by the company. A list of payments, with bits missing, was disclosed to a closed circle of people buried in several lever arch files - and only then in response to a document request. This material is due to be scrutinised in more detail in Part 2 of the Leveson Inquiry, which the Daily Mail has been campaigning to prevent happening. Victim of press intrusion Jacqui Hames, a former BBC One Crimewatch presenter, said: "Victims have said time and time again that another scandal would happen without meaningful press reform. "The Government must stop stalling the Leveson Part 2 inquiry into police and press corruption, and cover-ups of criminality which will look into these allegations." The former policewoman, whose phone bills were "pulled," added: "The Leveson Inquiry is unfinished business and those who have had their lives damaged by mercenary press bosses deserve the truth." The official who led the ICO investigation, said it was ‘disgusting’ that the Mail carried on using Whittamore to such an extent - and is angry that the paper has escaped justice. Retired Information Commissioner's Office investigator Alec Owens said: ‘‘I am not only amazed by the £150,000 paid to Steve Whittamore after I raided him, but also disgusted with the Daily Mail for carrying on after our investigation was active. Associated Newspapers conducted an internal investigation into their reporters' use of the private detective and examined their payments system before giving evidence at Leveson in early 2012. Yet both Daily Mail editor, Paul Dacre, and legal chief Liz Hartley, failed to dislose in their oral evidence or witness statements the extent of their use Whittamore and the huge payments made to him after his bust, arrest and conviction. Meanwhile, former Mail on Sunday editor Peter Wright was unable to shed light on two mystery payments to Whittamore in 2006, a year after his conviction. Even though the newspaper had claimed to have ‘virtually stopped' using Whittamore in September 2004 – which was itself over 18 months since he was raided by the ICO. The remittance advices, stamped with the company’s trademark royal blue letterhead, show £10,000s flowing into private detective Steve Whittamore’s bank account. Our investigation comes amid mounting criticism of the controversial 121-year-old paper. It has emerged that Former PM David Cameron called for the resignation of editor Paul Dacre over his paper's coverage of Brexit, and Lego has pulled marketing deals over racism allegations by campaigners Stop Funding Hate. Meanwhile former Prime Minister Tony Blair has accused the newspaper of 'hypocrisy' after it condemned him for releasing a man who went on to commit a terrorist atrocity - despite the Mail having led a media campaign for him to be set free. The newspaper has also lost credibility after being banned as a source for Wikipedia over fake news claims. Whittamore - Britain’s most prolific media trader in illegal data - has confirmed to Byline Investigations that many of the jobs that he did for the Daily Mail after he was busted were against the law. Which is the reason, he claims, that he charged the middle-market tabloid so much money per 'blag', as illustrated in the photographs of the remittance advices on this page. Since his conviction, the father-of-one has paid a heavy price, feeling that he has been 'hung out to dry whilst powerful people got away scot free.' After his business was destroyed, he lost his house, his marriage and he fell into a drink-fuelled, decade-long depression. Meanwhile, no one at the Mail has faced justice. The cache of paperwork, which has never been seen before, covers a three year period FOLLOWING the raid on his office for data ‘blagging’ in March 2003. Executives at Associated News - the company that owns the Daily Mail and Mail on Sunday - have repeatedly tried to play down that the paper used Whittamore after his office was searched - and claim that they assumed most of his work was above board. This is nearly as much as the £143,150 paid to him by the Daily Mail and its Weekend magazine before he was raided, in connection with 1,700 requests previously for potentially illegal information. After he was raided, The Mail on Sunday tasked Whittamore four times, worth a total of £1,833.01. The Evening Standard, which was then owned by Associated Newspapers, tasked Whittamore 48 times and paid him £21,807.88. Whittamore’s secret contact list shows 39 Associated News journalists, including the Managing Editor at the time, and the then News Editor Tony Gallagher, who now runs the Sun. The PI's wife Georgina Whittamore hid the contact list from Information Commissioner's Officer Alec Owens during the raid by stuffing it down her trousers - and was able to carry on running their business after the police had left. During this period, the Daily Mail’s news desk was run by Tony Gallagher. Whittamore’s supply of illegal phone numbers made sure Gallagher’s reporters got stories before the competition. Both bosses have campaigned vociferously to prevent a second Leveson inquiry from happening. Critics claim Gallagher doesn't want his own alleged links to criminality to be probed. 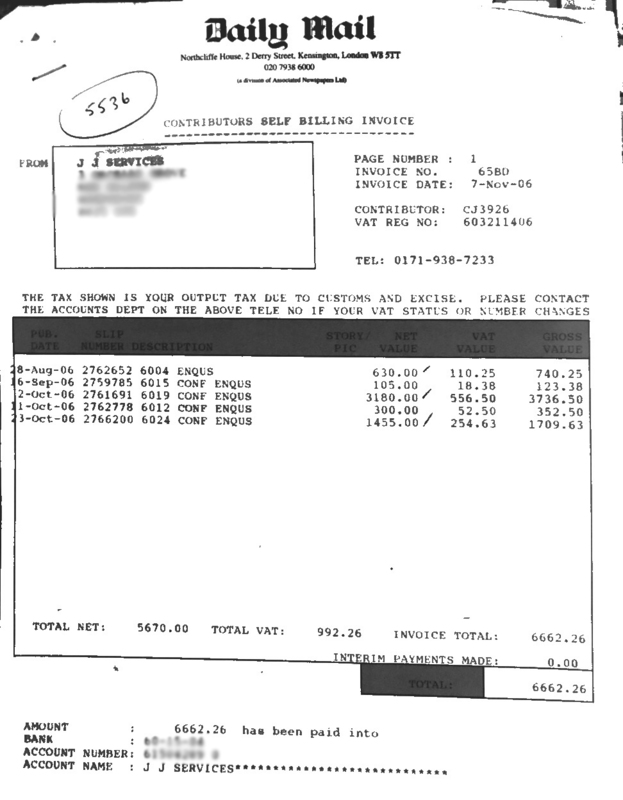 Many of Whittamore’s most recent invoices are addressed to the Femail section of the newspaper. At the time, the department was run by Lisa Collins, who later became a senior executive at the Sun until 2015. A day ago, Byline Investigations contacted the Daily Mail, IPSO and the Sun by email for a comment, but none has been received as yet. We will update this story if any response comes in.